At C & L Landscape, we do more than just provide residential and commercial landscaping to Jacksonville and the surrounding communities. We also specialize in dock building, boat lifts, and other types of marine construction. Many boaters grapple with whether or not to invest in a boat lift. Sure, it’s a big upfront investment, but it also saves you a lot of time, money, and hassle for years and years to come. Today. We’d like to discuss seven ways a boat lift can benefit boat owners throughout Florida. Water can actually damage a boat. It doesn’t make sense, considering that boats are designed to be in water. But sitting in water for months on end during the stormy season can cause your boat to actually absorb water, causing the hull to blister and warp. In addition, a sitting boat is a perfect place for algae, barnacles, scum, and a host of other ocean and river creepy crawlies. Here in Jacksonville, water levels can fluctuate, especially during hurricane season. Not to mention summer storms and other boaters can cause rough waters that knock your boat around. Even if your boat is a sturdy, seaworthy vessel, continuously bumping up against the dock can cause dents and chipped paint, making the perfect place for rust to start taking over. With a boat lift, you don’t have to worry about a boat cover. We offer different kinds of boat lifts to fit your needs, but we suggest one with a canopy. This way, you don’t have to spend time pulling a cover off and putting it back on every time you take the boat out. When you have and utilize a quality boat lift, you can spend less time scrubbing and washing scum off of your boat, and more time enjoying our beautiful water. After all, you probably got a boat for fishing or enjoying leisurely rides, not to spend hours at the end of the season trying to salvage your paint job. Did you know that an estimated 80% of boats that sink do so while docked? Most often this is caused when a fitting on a pump below the waterline has failed, but can also happen when a dock gets trapped below a dock during rising tide. All of this can be avoided with a boat lift. If you decide to sell your boat for an upgrade, a boat that has been dry-stored can sell for 15-20% more than a boat that has been sitting in the water for years. 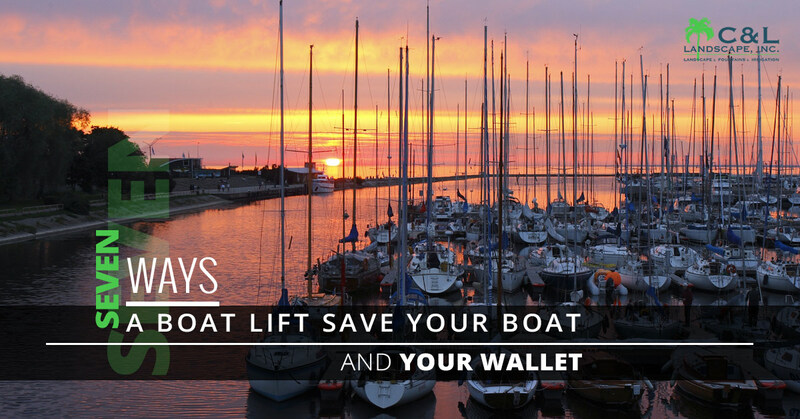 A boat lift can make getting on and off of your boat easier. How many times have you had to pull back to the dock when the waters started getting rough? Rough waters, high or low tide, and other conditions can make getting from the boat to the dock and vice versa difficult. A boat lift will keep the boat steady while you get in and out, reducing the chance for falls and accidents. Whether you still haven’t rebuilt a dock damaged during hurricane season, or you simply want to reap the benefits of a boat lift, our experienced and licensed team can provide multiple varieties of constructed and floating docks, boat lifts, and seawalls. As always, we also provide landscape design for commercial and residential landscaping, so your property looks beautiful from the back porch to the waterfront. Contact the experts at C & L Landscape today, and see what we can do for you!